China and South Korea have condemned a visit by Japan’s defense minister Tomomi Inada on Thursday to the controversial Yasukuni Shrine, a Japanese war memorial in Tokyo. The shrine was built in honor of the 2.5 million Japanese dead during the Second World War, but is seen by some of its neighbors as glorifying a Japan’s imperialistic bloody past. Among the dead and honored are 14 Class-A convicted war criminals. Both China and South Korea accuse Japan’s Imperial Army of committing numerous atrocities during its occupation of their countries in World War II. Japanese troops killed 300,000 people in the 1937 Nanjing massacre. “This not only reflects some Japanese people’s obstinately wrong view of history, it is also greatly ironic given the Pearl Harbor reconciliation trip,” said the Chinese Foreign Ministry spokeswoman at a presser on Thursday. Chinese President Xi Jinping had earlier condemned those who “ignore the iron facts of history” in a jab at the cabinet of Japanese Prime Minister Shinzo Abe. 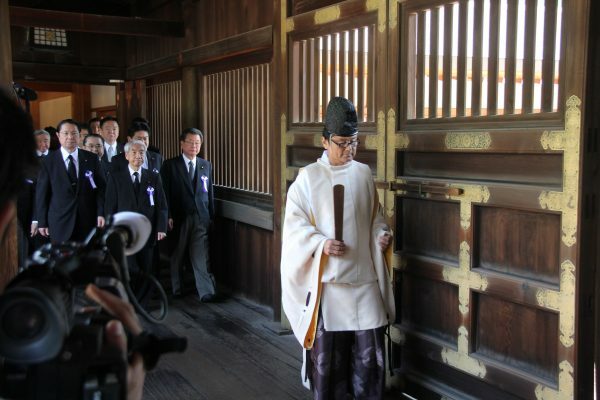 Abe himself has not visited the shrine in nearly three years but several members of his party and cabinet have done so routinely. South Korea also protested the visit, summoning a senior official from the Japanese embassy in Seoul. “Our government cannot but deplore [the visit],”, South Korea’s foreign ministry spokesperson said in a statement. This came directly after Inada’s return from Hawaii, where he joined Abe and US President Barack Obama to commemorate the victims of the Pearl Harbor attack – in what was the first visit by a Japanese leader to the site.